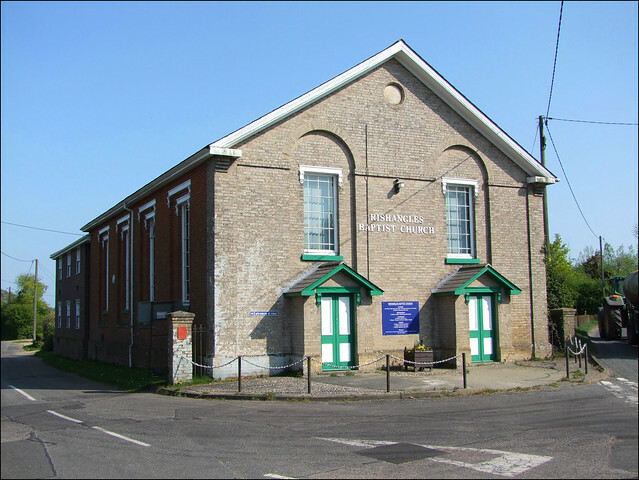 This fine Baptist chapel, set prominently at a corner on the Debenham to Eye road, was erected in 1841. The yellow brick neo-classical frontage is a contrast with the rather more rustic red brick of the sides, with tall windows stretching almost to the eaves. There is a good 1980s extension behind. At the time of the 1851 Census of Religious Worship, Rishangles Particular Baptist Chapel had a capacity of about 220, and was full for the afternoon sermon. There had been 180 in the morning, and George Harris, the minister and a local farmer, claimed that it was attended by the poor of all neighbouring parishes. Charles Hill, the pastor of the Particular Baptist Chapel at nearby Stoke Ash, made a similar claim, and undoubtedly this part of Suffolk was predominantly non-conformist in character rather than Anglican. Rishangles had a small Wesleyan Methodist chapel attended by 30 people that morning, but even that was better than the mere 22 who attended the Church of England parish church of St Margaret. That was 160 years ago, but perhaps it should come as no surprise that Rishangles Baptist church survives and thrives, while both the Methodist church and the Parish church are no longer with us.